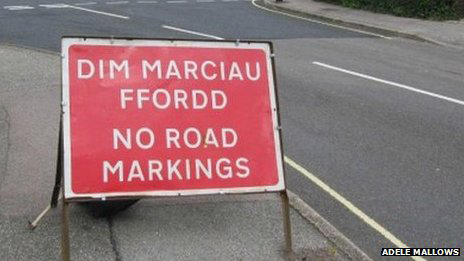 Following on from our recent Welsh typos, thanks are due to Emlyn J for sending this in. Adele Mallows thought it strange that she should find this sign in Purbrook, Hampshire. That's about 120 miles from Wales. Local Councillor Mel Kendal said Hampshire Council had not known that the bilingual signs were being used, and asked the contractor to replace them. 'Possibly because English language only signs were not available at the start of the works, the contractor used dual language ones instead,' he said. But what he failed to say is that the 'important message' is completely meaningless in either language. As Adele points out, the road markings are clearly there.